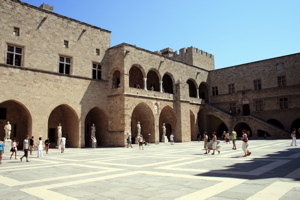 "Palace of the Grand Master - learn the history of one of the top Rhodes town sights and museums!" As your Mediterranean cruise ship sails into the commercial port of Rhodes, get out onto the open decks and admire the magnificent walls that encircle the old city. One structure that stands out and dominates the old Rhodes town, perched up on a little hill is the Palace of the Grand Master, in which today's Museum of the Castello is situated. You can locate it on our Rhodes map. Just the glimpse of it from far away will make you impatient, and you'll want to get off the gangway as soon as possible and explore all the secrets hidden inside those walls. The Palace of the Grand Master was built by the Knights of St. John in the 14th Ct. Legend says it was positioned on the foundations of the temple of the sun god Helios that stood there in antiquity. That explains why it is said that the Colossus of Rhodes, which represents Helios, was situated here too. In Byzantine times, there was a fortress situated on the site where the Palace of the Grand Master is today, and its remains have been discovered and built into the walls of the ground floor. The palace was the heart of the Kollakion, the part of Rhodes town that represented the administrative center in the times of the knights. In the Kollakion, all the important buildings were situated... the entire Street of the Knights with its inns belonging to the different languages/countries into which the Order was divided. And the Palace of the Grand Master was like the “cherry on the top”, its elevated position clearly telling us it was here that the “boss” lived. And it's true… the Grand Master exercised supreme authority over the island. 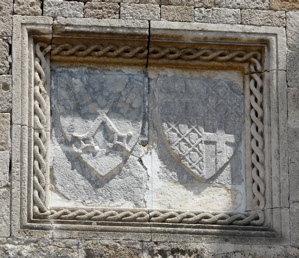 The Grand Masters were all members of noble families and you can often see their coats of arms on the buildings and fortifications of Rhodes. Apart from being the residence of the Grand Master, the Castello played a big role in the city's defence and was designated as a refuge for the inhabitants in case they fell to an enemy. The building was affected during the siege by the Turks, and a big earthquake in the 15th Ct, but was soon repaired. The final blow to the building was in 1856, after a big explosion of munitions stored in a church just a few meters away from the Palace. In that explosion, only the ground floor was saved. In the following years, the Turkish use of the palace as a prison didn’t help either. It was only in 1937 that the Italian Governor of the Dodecanese (the group of islands that Rhodes is part of), decided to restore the palace and turn it into a luxurious residence for himself. Due to the arbitrary changes his architects made in and around the palace, many elements of history have been lost. 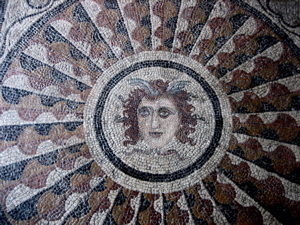 However, the good thing is the palace has been more or less successfully restored and it is a big attraction of Rhodes. Inside the Castello there are 158 rooms in total but only 24 of them are open to the public. A copy of the famous Laoocon group by Rhodian sculptors, the original of which is kept in the Vatican Museum… and many other pieces of furniture and antiques on display for public viewing.